BNI Senior Finals are here!!! 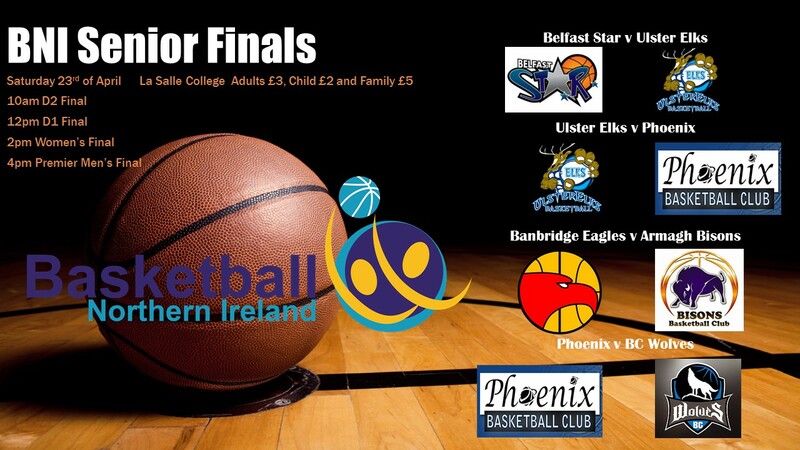 The BNI finals are being hosted on Saturday the 23rd in De La Salle College. This will be the final set of games of this season. The premier league final have 2 main stays who meet regularly in the Finals with Star and Elks suiting up again, this year Elks won the league while Star won the cup so this will be the decisive game of the season. The women’s premier league has the top two ladies league teams meeting in the final, last season Phoenix took the play-off title but Elks won the league this season so again this will be a massive match-up. The D1 final has two teams that have bobbed up and down from premier league and have proved the strongest in D1, Banbridge Eagles and Armagh Bisons may well get promoted into top league again. The D2 final has 2 new teams with great structures and both want to play up into D1 the young Phoenix team will battle against the veterans of the Wolves, Wolves have won the league and the plate and this will be the only team that could do a clean sweep!! !